Planning activities for seniors with impaired vision requires a little creativity. However, you can keep your loved one engaged by exploring activities that involve the other senses. Through involving the senses of touch, hearing, and taste, you can provide seniors with impaired vision a variety of experiences that stimulate their mind and body. Aging adults who require assistance with the tasks of daily living can benefit from reliable in-home senior care. Oshkosh, WI, families trust in Home Care Assistance to provide the high-quality care their elderly loved ones need and deserve. Our caregivers are trained to help seniors prevent and manage serious illnesses and encourage them to make healthier decisions as they age. There are many arts and crafts that can be enjoyed by seniors with limited vision. However, sculpting might be a new one for many seniors. Sculpting is a sensory experience that allows seniors to dig their hands into clay and feel the art as it is being created. Seniors can share the art with other friends who have impaired vision because they can also use touch to feel the features. Seniors can sculpt with classic materials such as clay, or they can increase the sensory experience by using other materials such as metal and papier-mâché while creating their work of art. Many communities host low-cost educational lectures. Help your loved one check with a library, a senior center, or a local community college to find lectures he or she might be interested in. Your loved one might also be interested in motivational speaking events. Alternatively, your loved one could listen to recorded audio lectures and take them to doctor appointments and other places where he or she has to wait. Some seniors need assistance with transportation to events and medical appointments. If your aging loved one needs help managing the tasks of daily living and you’re searching for a reliable, expertly trained caregiver, Oshkosh, WI, Home Care Assistance is your top choice. At Home Care Assistance, our caregivers strive to make aging in place a safer and more comfortable experience for seniors so they can enjoy their golden years in better health. Many classic board games come in versions designed for seniors with visual impairment. For example, there are dominoes with raised dots that your loved one can feel and large-print versions of decks of cards that may be easier for him or her to see. There are also video and computer games that involve audio play, which can entertain your loved one. Seniors with visual impairments can enjoy listening to their favorite songs and benefit from its soothing effects. Arrange for your loved one to attend a concert with a caregiver. Seniors who really enjoy music can also learn to play an instrument, which can be modified to accommodate limited vision. Gardening can be healing for a senior’s body and soul. A garden provides a multisensory experience that can fill a senior with joy, even if he or she has impaired vision. Encourage your loved one to plant fragrant herbs and flowers such as lavender. Your loved one is likely to smell the beautiful scent of his or her hard work every time he or she steps outdoors. 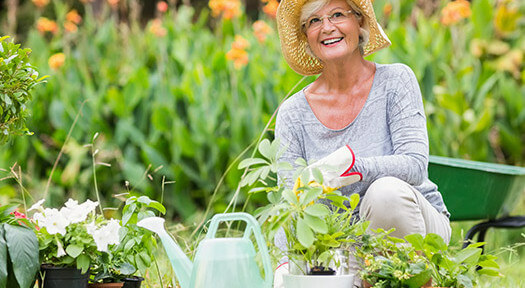 From adding plants with texture to bold blooms that brighten up the outdoor space, there is always something to do in a garden and seniors will usually find something interesting to keep them busy. Some seniors need occasional assistance at home, and oftentimes the family members who take care of them need time away to run errands, take a nap, go to work, or take a vacation. Oshkosh, WI, part-time care experts from Home Care Assistance are available on an as-needed basis, giving your family peace of mind that your loved one will remain safe and comfortable while you relax or focus on other important responsibilities. Call a qualified Care Manager at (920) 710-2273 to learn about our senior home care services and to schedule a free in-home consultation.